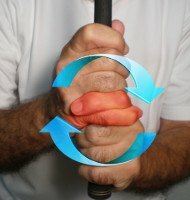 The perfect swing begins with the perfect grip. Adam Scott grip – like his textbook takeaway, swing plane and follow-through – is a thing of beauty. His left and right hands are square to each other and the clubface. The Vs formed by both thumbs and forefingers are aligned with a point between his right shoulder and his chest’s center. His grip pressure is firm but light. But even Scott has to work to maintain a proper grip. His natural tendency is to rotate the hands into a strong position, with the Vs pointing closer to his right shoulder. With a swing as finely tune as Scott’s, any deviation can create problems like hooks or a low ball flight. To make sure his grip is where he wants it, Scott checks the position of his left hand before every shot. Only then does he proceed into his setup. Scott’s swing has always been the envy of his peers. His putting, not so much. After years of struggling on the greens, Scott switched to a long putter in 2011. Long story short (so to speak), improved putting propelled the Aussie to No. 1 in the world rankings in 2014. Adam Scott grip with the long putter is simple as can be. He uses the left hand to anchor the top end to his upper chest. 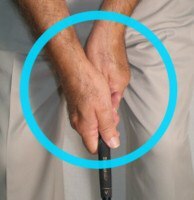 His right hand points downward, open and facing the target, gently holding the club between thumb and forefinger while the other fingers dangle to the side. This nearly pressure-free grip allows Scott to sweep the putter effortlessly back and through.